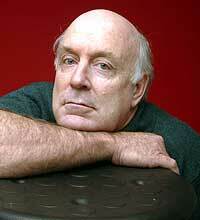 An excellent inductee for this year’s Hall of Fame has been announced by the TV WEEK Logies: John Clarke. New Zealand-born Clarke has been part of our television landscape for many years, collaborating with Graham Kennedy, Max Gillies, Geoffrey Rush, Andrew Denton, Sam Neill and Gina Riley. Perhaps best known for his satirical political interviews on A Current Affair with long-standing comedy partner Bryan Dawe, he has been pivotal behind the scenes on many comedy shows including The Gillies Report, The Games, Anzacs, The Adventures of Lano and Woodley, and the telemovies by Shane Moloney (Stiff, The Brush Off). Last year’s Dagg Sea Scrolls was very popular on the ABC. “I’m inclined to regard this as a youth encouragement award. I’m deeply grateful and will do what I can,” he said. One would hope it is Brian Dawe who presents Clarke with the award, but the Logies will probably opt for a higher profile personality in Sam Neill, Max Gillies or Gina Riley. Nevertheless, a good choice. There is nobody who quite gives us a view of the world like Clarke! TV WEEK announced today that legendary satirist John Clarke will be inducted into the prestigious Hall of Fame at the landmark 50th Annual TV WEEK Logie Awards next month. John Clarke is being recognised for his esteemed contribution to the Australian television industry, through work as performer, writer and director. Since arriving here in 1977, the New Zealand-born comic has wooed the Australian public. He began with his trademark political satire “interviews” alongside comedian Bryan Dawe on ABC radio, then moved to A Current Affair, where they were a part of the program for many years. The pair’s genius act can still be seen weekly on The 7.30 Report. John’s collaborations over the years with Australia’s leading performers – including Graham Kennedy, Max Gillies, Geoffrey Rush, Andrew Denton, Sam Neill and Gina Riley – have produced comedy gold, while his prolific writing career has spanned drama series ANZACs to acclaimed mockumentary The Games. It’s his unique ability to make us laugh at ourselves that’s made John Clarke’s talent such a valuable treasure. From his genesis as Fred Dagg to all his current guises, he is a truly worthy recipient of this prestigious award. John Clarke is now in the rightful company of past Hall of Fame recipients such as Hector Crawford (1984), Ken G Hall (1985), Neil Davis (1986), Paul Hogan (1987), Bert Newton (1988), Bryan Brown (1989), John Young (1990), James Davern (1991), Four Corners (1992), Reg Grundy (1993), Charles “Bud” Tingwell (1994), Jack Thompson (1995), Maurie Fields (1996), Garry McDonald (1997), Graham Kennedy (1998), Mike Walsh (1999), Bruce Gyngell (2000), Ruth Cracknell (2001), Mike Willesee (2002), Don Lane (2003), Sam Chisholm (2004), Neighbours (2005), Play School (2006) and Steve Irwin (2007). The TV WEEK Hall Of Fame Award is presented to a nationally known individual or program for an outstanding and sustained contribution to Australian television. Recipients of this award will have shown commitment and passion through their work – ultimately contributing to the enrichment of Australian television. While this is a lifetime achievement award, recipients may yet have further work of significance to be accomplished. The 50th Annual TV WEEK Logie Awards will be held on Sunday, May 4, at Crown Entertainment Complex and televised on the Nine Network. The awards ceremony will be preceded by a Red Carpet Special Presentation hosted by Jules Lund, Livinia Nixon and Shelley Craft. Enjoyed the night. Clarke & Dawe always entertain me. And thank you for the Logies – I actually got my ironing done. and they say just not jist. There were one or two others who spoke well too.. and isnt Don Lane’s son like his father? How and when did John Clarke collaborate with Graham Kennedy? I don’t seem to recall. I’m a bit surprised that Home and Away wasn’t inducted this year seeing as Neighbours was when they turned 20. But he’s a very deserving member!